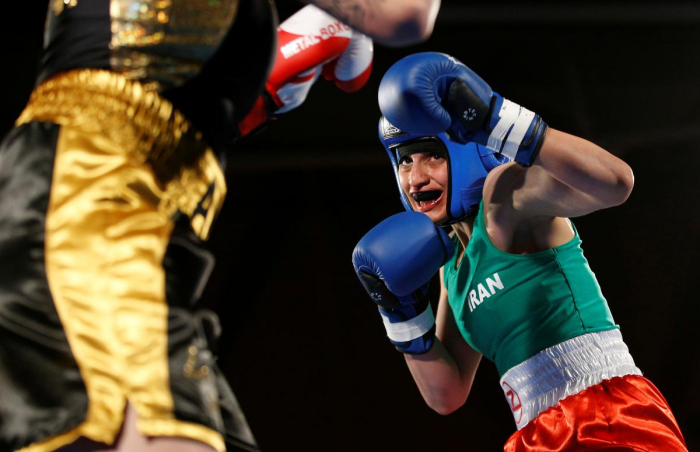 Sadaf Khadem, who on Saturday became the first Iranian woman to contest an official boxing bout, has canceled her return to Tehran after an arrest warrant was issued for her there, her representative said on Wednesday. An arrest warrant was also issued against Mahyar Monshipour, the Iranian-born former boxing world champion who set up the bout in western France and was planning to travel back to Iran with Khadem this week, the representative, Clara Dallay, told Reuters. Monshipour is a French citizen. On Saturday, Khadem beat local boxer Anne Chauvin in an amateur bout. The 24-year-old, who was in Paris on Monday, was returning to Monshipour’s home town of Poitiers. Franco-Iranian relations are in a tense phase after comments by France’s ambassador to the United States last week on Iran’s nuclear program sparked an angry reaction from Tehran. Iran’s Boxing Federation said on Monday that it organized no bouts for women and would bear no responsibility for individual competitors. Iranian women should wear the Islamic hijab while competing in the country and abroad, it added. The Federation was not immediately available for comment on Wednesday. France’s foreign ministry could not immediately comment on the case. A spokesman from Iran’s embassy in Paris said he had received a request to confirm there was an arrest warrant out and to comment on Khadem’s and her coach’s decision not to return to Iran. He gave no other comment.